Ever heard of BPA? It stands for Bisphenol A, a chemical that hardens plastic. It can cause negative health effects when ingested, which makes it important to find a coffee maker that is BPA-free. If you are wondering about the best BPA free coffee maker on the market, this post has got you covered! While you might be overwhelmed with the long list of the options, do not take this as an excuse to decide in haste. All the more, you have the reason to be careful. This guide will list down some of the top products on the market, as well as their exceptional features. We’ll also give you a glimpse of everything to know about BPA free coffee makers. Bisphenol A is an industrial chemical that has been widely used since the 1960s, specifically in the production of plastics and resins. To be specific, it is a major component of polycarbonate plastics, which is the main material in plastic containers. Coffee makers with plastic parts, especially the carafe, can contain BPA. According to research, BPA can be ingested if it gets in contact with the food and drinks that are stored in bottles that are made using such chemical. In coffee makers, BPA is often found in the inner parts, including the carafe, filter basket, and water tank. They get in direct contact with the coffee that you drink, which makes it an important concern for safety. Therefore, it is critical to choose a coffee maker that is not made using plastic parts. If there is plastic, at least, they should be in the exterior or the parts that do not touch the coffee. Let’s get straight to the point. If you are curious about which one to buy, below are some of the best products that should be on your list. Want to give the kitchen an upgraded look? This coffee maker will do the job! It has a futuristic style that gives any space a hint of elegance! There is more to this than its sophisticated appeal, though. It has an intelligent microprocessor-controlled brew cycle. This allows it to function similar to the pour-over method of coffee preparation, making sure of timely cycles and optimal extraction. To add, it also has a rainmaker showerhead. The latter is an innovative hole pattern that is beneficial in terms of evenly dispersing water. The coffee maker also has features that will make it effortless to use. For instance, there is precise temperature control to ensure the right level of heat all the time. It also has a programmable timer and an intuitive LED display. The coffee maker has a vacuum insulated carafe made of stainless steel to keep your coffee hot for an extended period. The carafe has an ergonomic and non-slip handle. However, for those who are looking for a budget-friendly coffee maker, this is not the right pick. It is expensive, although the price is easily justifiable by its superior performance and exceptional quality. For a large household or office, this is one of the best BPA free coffee makers to take into account. It has a glass carafe with a maximum capacity of 14 cups! If you want to brew smaller quantity, no problem! It can also brew one to four cups at a time. The mere fact that it is made by Cuisinart is already a good reason to consider this model over its competitors. After all, the company is known for having a wide array of BPA-free products. Looking at its features, one that will captivate your attention is the PerfecTemp technology. This is a state-of-the-art feature that ensures the ability to maintain optimal temperature so that you can always enjoy your coffee hot! You do not need to exert too much effort when using this coffee maker. It can be programmed for 24 hours. There is also a self-cleaning feature. Plus, it automatically shuts down on its own. The control panel is also intuitive and has buttons for individual functions. It also has a gold tone filter to make brewing easier. Nonetheless, this is not a perfect coffee maker. One of the potential issues is the design of the spout, which can sometimes make the water prone to spilling. While the inner parts are indeed made of plastic, there is no need to panic! The manufacturer ensures that all of the parts that come in direct contact with the beans and water do not contain any BPA, making sure of your health and safety! This is also good for a large household as it has a 12-cup capacity. It works similar to an automatic drip coffee maker. All that you need to do is to add water, filter, and ground coffee! Voila! Your coffee is ready soon! Instead of having the traditional carafe, it has a built-in tank with a gentle heater. With the latter, the right temperature of the coffee is maintained. Even after hours, you can still enjoy the freshness of your caffeine fix! There is no glass carafe that can be easily prone to breaking. You will have full control over how your coffee turns out to be. You can choose from four brewing strengths. There is also a programmable timer and you can brew even one to four cups only. Budget-conscious buyers, rejoice! This is one option that is easy on the wallet and capable of delivering decent performance! It is devoid of the advanced features you can find in the more expensive models, but this is pretty good enough for most users. Because it is BPA-free, the manufacturer claims that you can make 97% better tasting coffee. This can also be attributed to the adaptable filtration that allows it to get rid of chlorine in the water. Meanwhile, it has a removable and economical filter basket. You will love how easy it is to remove the filter! The simplicity of this product is one of its best features. There is a single button located in front of the unit. There is also an Auto Pause function, which will be useful when you need to have a cup before it is even done brewing. Meanwhile, with the dual water window, you can easily see how much water is already inside, which will prevent overfilling. However, take note that it does not have an automatic off function. There is a power indicator light to remind you whether the unit is switched on or off. Premium quality = expensive price. Although that is not often the case, this is one product that proves how you have to spend to enjoy an unrivalled performance. With one-touch brew operation, simplicity is one of the things that give it a competitive edge. Aside from being user-friendly, it is also worth noting that it is powered by a 1400-watt motor that heats water quickly at a temperature range of 195 to 205 degrees Fahrenheit. Meanwhile, with the design of the showerhead, it can provide the best saturation and extraction, providing an assurance that your coffee will taste like as if it has been prepared by a trained barista. Plus, because it is BPA-free, there is no plastic aftertaste in your drink! The durability of this product is also hard to match, making the price worth it! The carafe is made of long-lasting stainless steel that is also capable of keeping the coffee warm for hours. All other parts are also made to withstand the test of time. Nonetheless, while the simplicity can be a good thing, for some, this is seen as a disadvantage. It does not give you complete control of the process. You won’t be able to set the brew strength or the timer. Our 6th product on the list is the grand finale, the crème de la crème, the ultimate brewer. 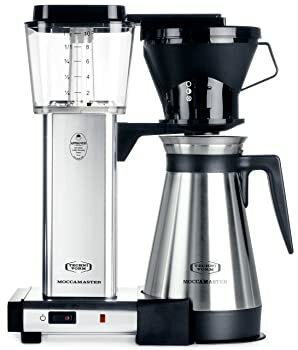 Technivorm Moccamaster 79112 KBT is a machine that simply can’t leave you aloof. The company’s aspiration is to provide a perfect cup of coffee to everyone. This complex & great-looking brewer can produce 10 cups of perfect coffee with rich taste & aroma, featuring 18-22% of dissolved soluble. Manufacturer is quite proud of this fact – it is achieved through perfect temperature setting, 196 – 205 degrees F. In just 4-6 minutes, 79112 KBT will complete the process. Furthermore, it will hold the unserved coffee in a carafe at 175 – 185 degrees F for up to 100 minutes before it turns of automatically. First and foremost, the taste of the coffee from this baby is marvelous. Hands-down, the choice of materials and craftmanship of Dutch engineers can truly make a difference. They went one step ahead and chose the perfect materials with extra care on all the standards, + they offer a 5-year guarantee. It’s not all sunshine and rainbows, though. The plastics are all BPA, BPS, BPF, & folate free, BUT these don’t look premium to me. Also, quite more people reported this. For the asked price, I think it could have gone better. Next, the complexity. You’ll need quite some time to master this thing & its goofy ergonomics. I’m thinking, if you need to mess around a coffee maker for 20 minutes to get it to work until you learn it inside out, something isn’t right. I’m not a professional barista, I just want my quick fix. One more thing; the 10-cup capacity adheres to European size cups. Standard American coffee cups are almost twice the size, so keep that in mind. To sum it up, when you learn to handle this complex & high-tech thing, it will start doing wonders for you. For a coffee maker that is made by a reliable brand, it is surprising to know that this is actually an affordable product. Nonetheless, while easy on the wallet, the performance is not inferior. Among others, one thing to love the most in this product is the DuraLife Glass Carafe. It has a 5-cup capacity, has accurate markings for precise measurement, and comes with an easy to grip handle. Because it is glass, no need to worry about BPA. In fact, all components that come in direct contact with your drink does not contain BPA. Hate having cold and stale coffee? Do not fret! This model comes with a special warming plate that retains the optimal temperature of the coffee even hours after it is brewed. This model also comes with a removable filter basket, which is dishwasher safe. Cleaning and maintenance will not be a hard task! It is also compatible with basket-type coffee filters! However, because of its price, expect utter simplicity from this model. You will have a lack of opportunities for customizing the coffee based on your personal preferences, such as in terms of its brew strength. According to the Food and Drug Administration, BPA is safe in small doses. But, would you risk it? There are continuing studies to learn more about BPA. However, better be safe than sorry. So, it would be best to stay away from anything that contains BPA, including coffee makers. Despite the claims by the FDA, there have been some animal studies with alarming findings, which should be enough for you to be concerned about how BPA can impact your health. The danger of BPA can also be linked to the fact that it is an endocrine disruptor. It imitates the hormones of the body. This can have an interference in the production, transport, and function of the normal hormones. Reproductive Issues: Most of the studies about the dangers of BPA support the claims that it can cause infertility, especially amongst males. Heart Problems: It has also been asserted that adults with high levels of exposure to BPA are at higher risk of having heart issues compared to those without exposure. Cancer: Although the study has been conducted using animal subjects, the findings indicate that BPA exposure increases cancer risks. Type II Diabetes: It has also been claimed that BPA will have an effect on insulin resistance, which is why it is linked to Type II diabetes. This is actually one thing that is quite easy to do. Look at the parts where you put the water and the beans. Also, take a look at the carafe. Basically, you must look at all the parts where your coffee will make direct contact to. It should be free of plastic parts. This way, you can be confident that BPA won’t get in your drink! If it is hard, clear, and almost unbreakable, this could be seen as one of the warning signs that it contains BPA. Here, we are talking about the carafe. It is probably made of a material known as polycarbonate plastic. Yes, the strength is hard to match. Unfortunately, chances are, it contains BPA. Another thing that you can do is to look at the bottom of the carafe. If it has number 7 or PC engraved, this goes to show that there is plastic used, and hence, you have a reason to believe that it contains BPA. However, the number 7 is not an absolute sign that it has BPA. Consult the manual to be sure. As it has been noted above, a BPA free coffee maker is one that does not contain plastic parts with direct contact to the coffee. This means that while plastic can be used, it should be limited to the exterior. French Press: This is one of the oldest types of coffee makers available. It does not contain plastic parts, making it a great choice. It comes with a coffee plunger that allows maximum extraction. The lid can sometimes be made of plastic, so better opt for one that is made of stainless steel, similar to the body. Stovetop Espresso Maker: If you like your coffee strong, espresso should be your choice of drink, and this is the perfect BPA-free option for you. Look for one that is made of food-safe stainless steel. More than being BPA-free, this material is also popular because of its durability. Percolator: Before drip coffee makers, percolators were the trend. Often, it is also made of stainless steel, which makes it BPA-free. It has a simple plug-and-play functionality. Plus, it is favored by many people because of its simple operation. So, if you have to pick only one, which would it be? Personally, we would say that OXO On Barista Brain 9-cup Coffee Maker stands out from all others, especially because of its elegant and futuristic design. However, all of the products mentioned in this guide are great and will make excellent picks for the best BPA free coffee maker!